Enjoy multi-touch functionality and enhanced student interaction. The Promethean Activboard 10 Touch combines multi-touch functionality, dry-erase writing, and award-winning software to foster an interactive learning experience at an affordable cost. Multi-user, ten-touch surface supports small group interactivity and collaboration creating an active learning environment for students. ActivInspire and ClassFlow offer free tools and resources for teachers to create and deliver interactive lessons and assessments. Combining the dry-erase and interactive surface creates a flexible system that can be used for every occasion. Multi-user interactivity with 10 simultaneous touch points and 2 styluses. Connect your computer to the ActivBoard Touch to power on the system and instantly get started. Providing teachers and students with a 3-in-1 surface that offers optimal viewing, multi-user interaction and dry-erase writing. Create and deliver interactive lessons and assessments with our award-winning software, ClassFlow and ActivInspire, included with your purchase. 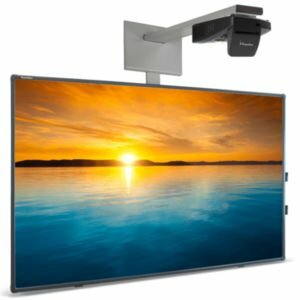 Contact Highline today to discuss our Promethean World portfolio, including displays, software and accessories. Promethean world specialises in educational technology solutions to create the dynamic environments, communities, and tools that empower teachers and motivate students to learn. Discover next-generation lesson delivery software that leverages technology to energize the learning environment and industry-leading interactive displays which are transforming the front-of-classroom experience around the world.